Looking for fixed price bargains on eBay? 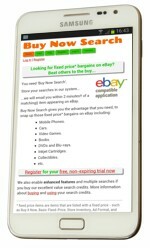 …you need ‘Buy Now Search‘ – an eBay Approved Application. …we will email you within 2 minutes of a matching item appearing on eBay. As of January 2014 Buy Now Search is available as an App for your Android powered smartphone.